From ancient times, the primordial man witnessed the wonderful spectacles in the sky. The curiosity of what is beyond our planet which is the space or outer space has driven mankind to create poetry and explore the scientific principles that govern the motions of the stars and planets apart from seeking answers to a multitude of questions. It was only a little over 50 years ago, that man actually went into space. The progress has been spectacular since the. Man has reached the Moon and the Mars; whereas the spacecrafts have travelled much longer distances. Thanks to powerful cameras and other sensing technologies, we have a much better understanding of the universe and the outer space than we ever had. The boundaries of our understanding of the outer space are expanding each day. 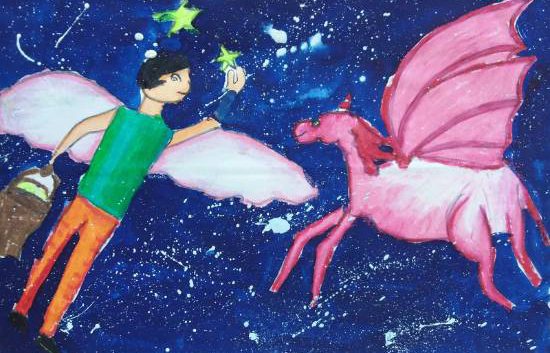 Khula Aasmaan urges children and young adults to explore the fascinating world of Outer Space through their creative expression. They can paint the stars, planets, galaxies, the space missions, the rockets and go beyond the current understanding. After all, the artist sees what the others will not. Children (5 to 15 years) can submit their artworks in the form of Sketches & Drawings, Paintings, Cartoons, Collage, whereas young adults (15 to 25 years) can submit their artworks in the form of Sketches & Drawings, Paintings, Cartoons, Comic Art, Posters, Doodles, 3D Art on paper, Photographs (camera and cellphone), Digital Art (any artwork created using digital tools).